Members of the United States Congress and 14 Vietnamese religious leaders have called for an end to the harassment and physical attacks of Pastor Nguyen Cong Chinh, a prisoner of conscience serving an eleven-year sentence in An Phuoc Prison in Binh Duong Province. After Pastor Chinh issued a written complaint on March 23, 2014 detailing occasions in 2012 and 2013 in which prison guards physically assaulted him, prison authorities forced him to stand in front of other prisoners while they subjected him to verbal abuse. 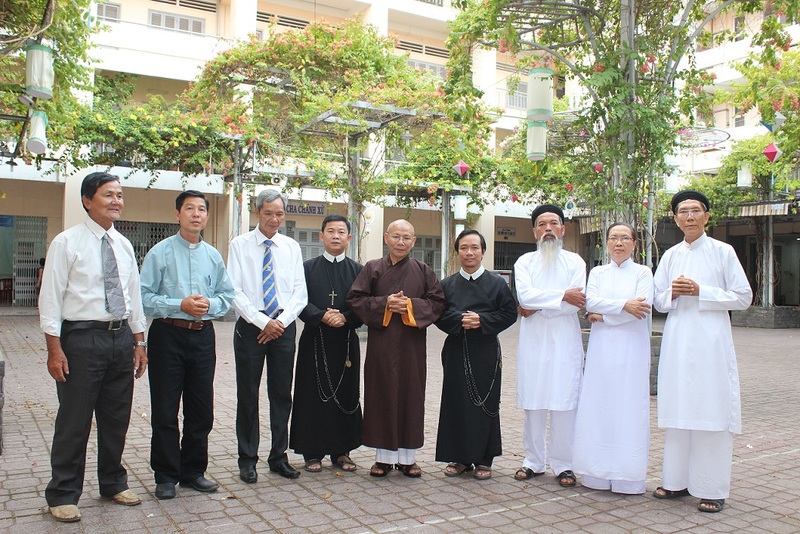 On May 29, 14 members of the Inter-Religious Council of Vietnam -- which includes Protestant, Catholic, Buddhist, Cao Dai, and Hoa Hao religious leaders -- sent a letter to Vietnamese Prime Minister Nguyen Tan Dung calling for an end to the "mental and physical terrorizing of prisoners daring to stand up against unfairness, and of prisoners of conscience." Members of the U.S. Congress, including ﻿Senator Marco Rubio (R-Florida) and Representative Bill Posey (R-Florida), ﻿have also expressed concerns about Pastor Chinh's treatment and called for his immediate release. Prior to his arrest, Nguyen Cong Chinh was an outspoken Protestant pastor, religious freedom activist, and democracy campaigner who had a long history of conflict with local officials. Originally from Quang Nam, since 1985 he has lived in the Central Highlands provinces of Kon Tum and Gia Lai, where he has focused his ministry on ethnic minority highlanders. In January and September 2004 police used bulldozers to destroy Pastor Chinh’s unregistered Mennonite chapel in Kon Tum, which doubled as his residence. In 2006, Pastor Chinh founded the Vietnamese People’s Evangelical Fellowship (VPEF), which focuses on charitable work in the highlands as well as assistance to minority prisoners and their families. In 2008 police summoned Pastor Chinh for daily interrogation sessions for more than 50 days. On April 28, 2011 Pastor Chinh was arrested at his home in Plei Ku, Gia Lai on charges of sabotaging the unity policy under Article 87. An article in the People’s Police newspaper the following day stated that the provincial police security investigation agency had collected hundreds of files through “administrative inspection” of “self-proclaimed” Pastor Chinh since 2003 that showed he had allegedly colluded with foreign reactionaries, including exiled members of the former Montagnard resistance group known as FULRO, to conduct anti-government activities. In particular, the article stated, he had collected information from websites of organizations such as Human Rights Watch and democracy groups based abroad, granted interviews to foreign media, and colluded with anti-government activists to falsely accuse Vietnam of suppressing religious freedom and call for its re-designation as a Country of Particular Concern for religious freedom violations. In 2009 Pastor Chinh received the Vietnam Human Rights Award from the Vietnam Human Rights Network in the United States. 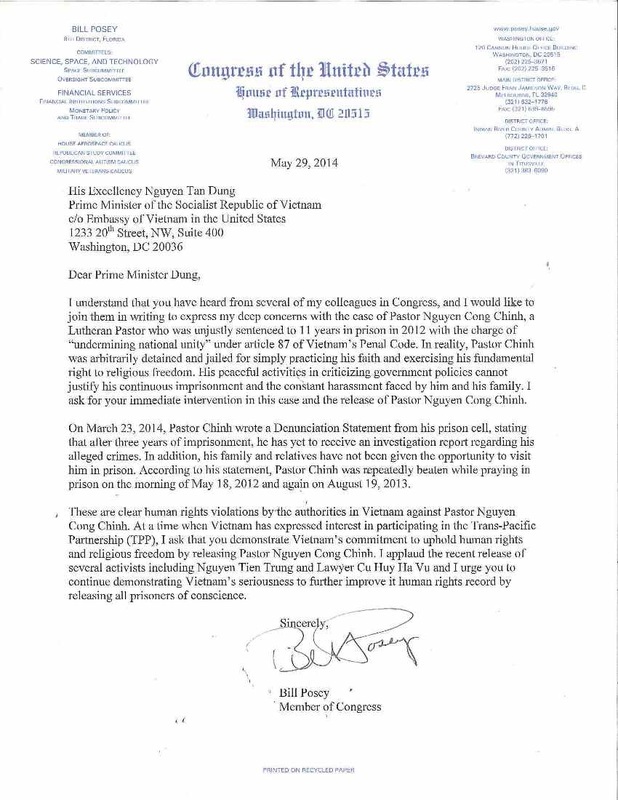 Rep. Bill Posey's letter to Prime Minister Nguyen Tan Dung, May 29, 2014. “…Pastor Chinh was arbitrarily detained and jailed for simply practicing his faith and exercising his fundamental right to religious freedom. "His peaceful activities in criticizing government policies cannot justify his continuous imprisonment and the constant harassment faced by him and his family. 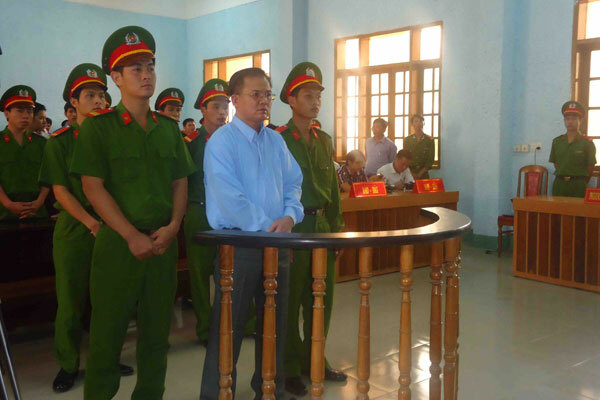 I ask for your immediate intervention in this case and the release of Pastor Nguyen Cong Chinh."